New year, new term, same struggle: For those students in the UO Graduate School who are stressed about their latest essay, journal entry or other writing task, the school is offering a new program that will provide a quiet space to concentrate and get peer support on writing assignments. Whether it’s pen-to-paper or finger-to-keyboard, graduate students can drop in to the Graduate Student Center in Susan Campbell Hall anytime between 8:30 a.m. and 11 a.m. on Wednesdays and Thursdays this term. 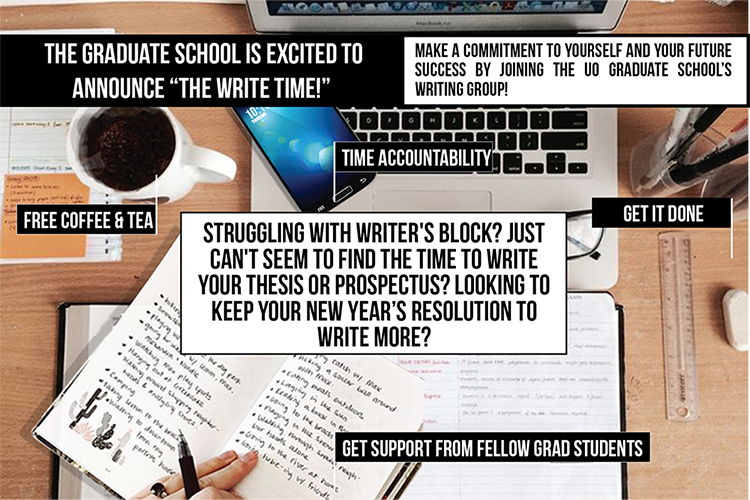 “The Write Time” officially launches Wednesday, Jan. 13. And, a literal perk: the Graduate School will provide free coffee and tea for students that bring a travel mug with them. Additionally, Kim Wollter, the Graduate School’s thesis and dissertation editor, has drop-in hours every Wednesday from 9 a.m. to noon.